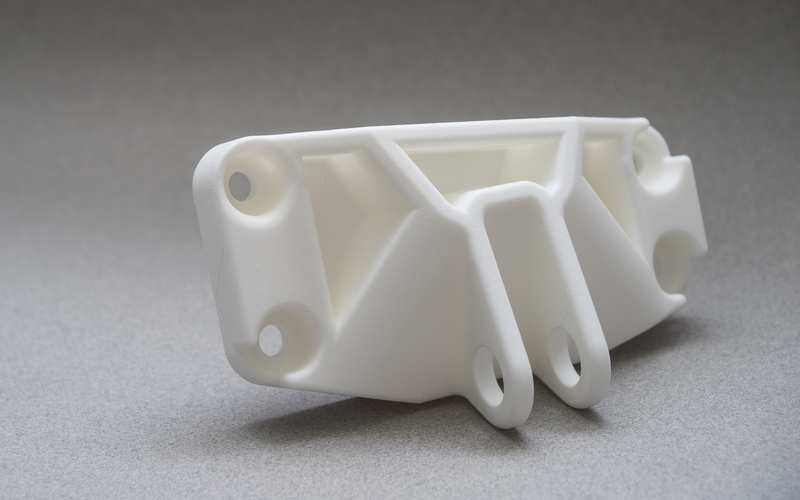 SLS 3D printing is the ideal solution for producing functional products with complex geometries. The technology has very few design constraints when compared to other 3D printing technologies and is also suitable for of batch manufacturing. This article will discuss the advantages of using SLS to 3D print parts, present the most common SLS materials and establish a clear set of design rules for designers to follow when printing with SLS. Selective laser sintering (SLS) is a powder-based fusion technology that uses a laser beam to locally sinter polymer powder to build parts layer by layer. A bin of the powder material is heated to an elevated temperature. A recoating blade deposits a very thin layer of the powdered material (typically 0.1 mm) onto a build platform. 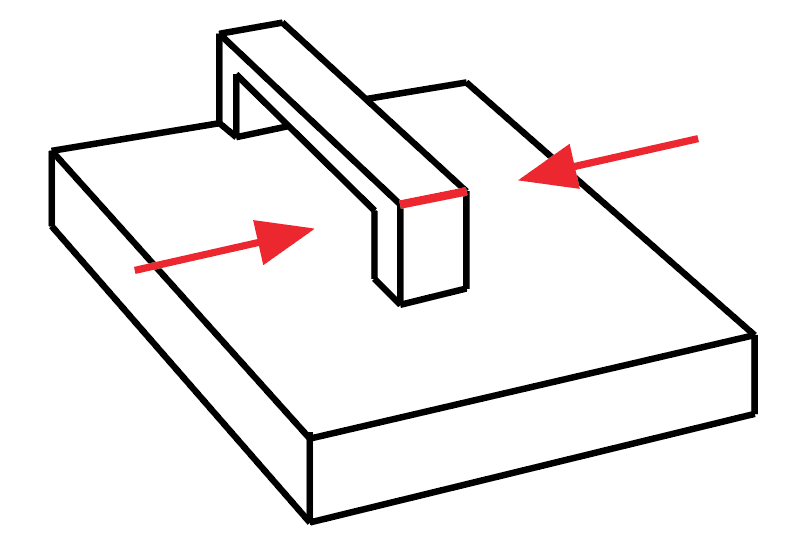 After deposition of a layer, a laser beam starts to scan the surface. The laser beam selectively sinters the powder and solidifies a cross-section of the part. When the entire cross-section is scanned, the building platform moves down one layer thickness in height. Unsintered powder remains in place to support subsequent layers eliminating the need for support structures. The recoating blade deposits a new layer of powder on top of the scanned layer and the laser beam starts to sinter the successive cross-section of the part onto the previously solidified cross-sections. This process is repeated until all parts are fully manufactured. The result is a container filled with powder and consolidated products. Since multiple products can be produced simultaneously the process can be used for batch manufacturing. 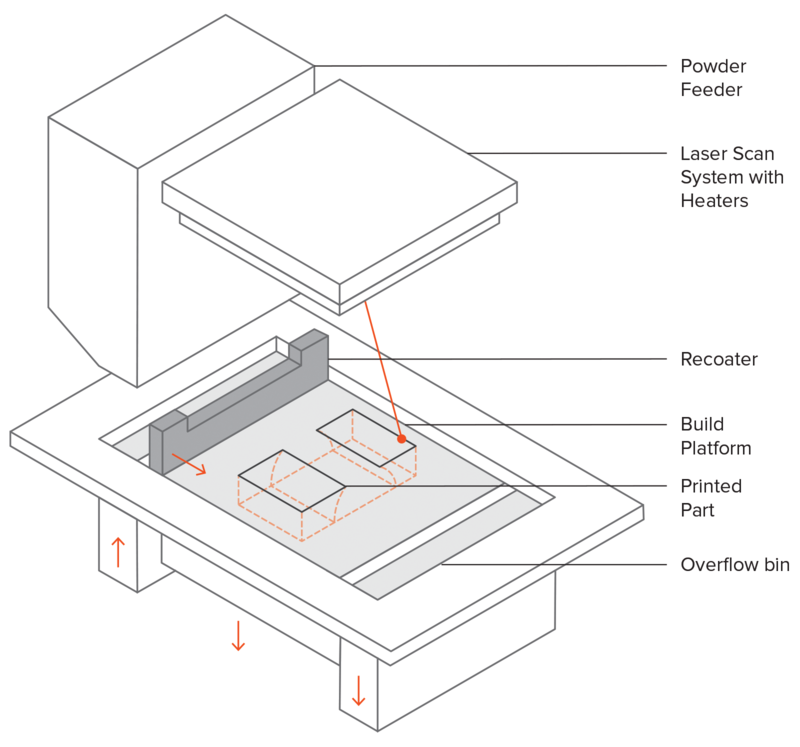 The placement and orientation of parts is optimized to maximize part occupancy in the powder box during each print. When the printing process is complete and the powder container and product have cooled down, the powder container is unpacked. The solid products are parted from the unsintered powder and cleaned with compressed air and a blasting medium. The remaining (unsintered) powder is collected and reused. The parts are then ready to use or are post-processed to improve mechanical properties or appearance. Like all manufacturing techniques there are several design recommendations that exist to improve the quality, surface finish and functionality of SLS parts. 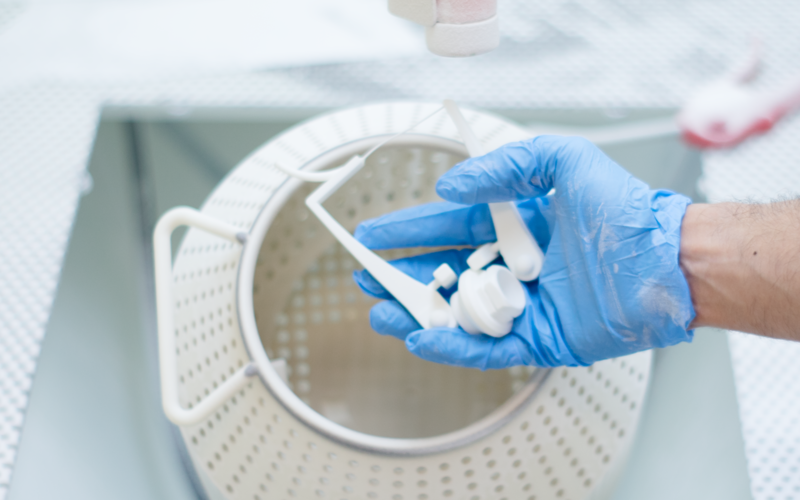 One of the most advantageous characteristics of designing and printing parts using SLS is that there is no need for support structures. The unsintered powder surrounding the part removes the need for support allowing highly complex and intricate designs to be printed. 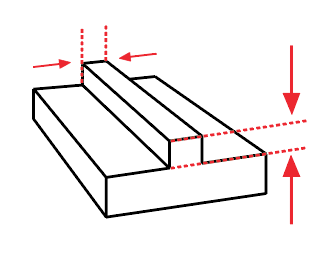 Wall thickness - The minimum wall thickness to ensure a successful 3D print varies between 0.7 mm (for PA12) up to 2.0 mm (for carbon filled polyamide). Hole size - All holes should be larger than 1.5 mm diameter. Escape holes - To save weight (and sometimes costs) SLS parts are printed hollow. To remove unsintered powder after production escape holes must be included. Escape holes must be a minimum of 3.5 mm diameter. Feature size (pins, protruding features etc.) - A minimum size of 0.8 mm is recommended. Tolerances - Typical tolerances for SLS parts are ± 0.3 mm or ± 0.05 mm/mm, whichever is greater. The following table identifies some of the most common design applications for SLS and introduces several rules that will help to ensure a better quality SLS part. Axles Nylon as a natural bearing material will provide a smooth low friction mechanism for low load, low-velocity applications. 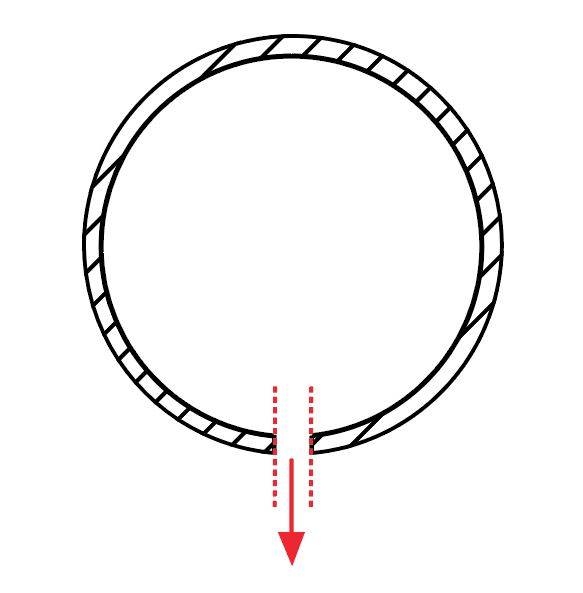 For running axles, a bearing surface clearance of 0.3 mm is recommended. It is important to remember that powder needs to be removed after the printing process to ensure a smooth running shaft. 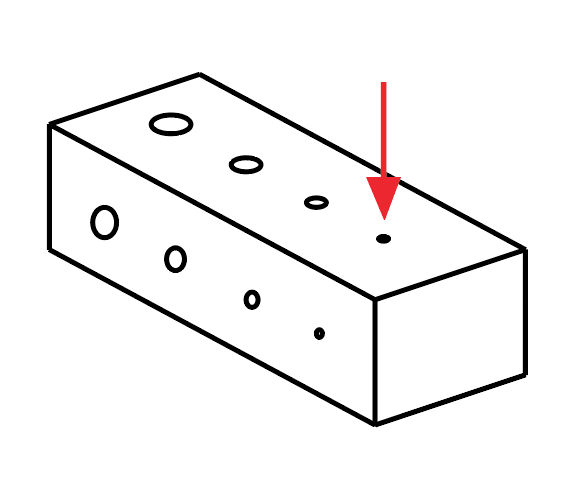 Include escape holes (minimum 3.5 mm diameter) wherever possible. A 2 mm between the running shaft axle and clearance shaft hole is recommended to also allow for powder removal. Integrated hinges Integrated hinges can work very well with SLS nylon when designed properly. A trapezoid shaped pocket that accepts a semi-spherical ball allows for low friction and good stability. 0.2 mm of clearance between the sphere and the pocket is recommended with 0.3 mm clearance between all other gaps. Interlocking parts Refer to this article for design advice on interlocking parts for 3D printing. Tanks SLS nylon offers good chemical resistance and is often implemented in custom tank design. For extra watertightness or when aggressive fluids such as fuel or solvents are to be used the tank can be coated or lined. A wall thickness of greater than 1 mm is recommended. Excess powder must be able to be removed from inside the tank. Threads The rough surface produced by SLS printing results in increased friction and can cause some issues when connecting threaded SLS parts together. It is possible to drill and tap SLS nylon. An ideal solution is only using SLS nylon for one of the threaded connections (either the hole or the bolt, not both). If the connection is critical to function of the part one of these methods for securing 3D printed parts should be considered. Living hinges SLS is one of the only 3D printing methods that can produce functional living hinges. For SLS hinges, anneal the hinge by heating it up (dipping in boiling water will often suffice) and then flexing the hinge back and forth. It is recommended living hinges are 0.3 - 0.8 mm thick and a minimum of 5 mm in length. As an SLS part does not need to be removed from a die, SLS is able to easily produce undercuts, negative draft and interior features. SLS eliminates the need for costly tooling, which makes it an affordable choice for small (1 - 1000) series production. 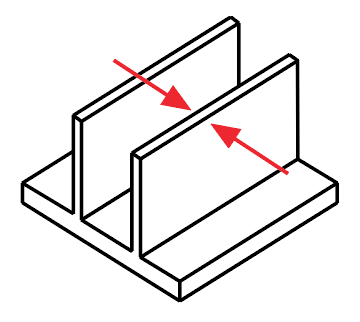 Perfectly sharp edges and corners are not able to be produced by SLS. The SLS process produces parts that have a radius of ±0.4 mm at all edges and corners. A radius less than 0.4 mm on a design will be printed as 0.4 mm. The natural radius produced by SLS offers some stress relief. For areas of concern, a larger radius (greater than 2 mm) should be added. Due to the high temperatures experienced by SLS components during the printing stage some shrinkage and warping can occur. SLS parts are typically cooled slowly to limit the impact of warping and shrinkage. Shrinkage - Most designs for SLS printing have overall dimensions increased by 3 - 3.5% at the pre-print analysis and conversion stage to accommodate shrinkage. This does not affect the design of a part. Warping - Large flat surfaces are most at risk. Consider adding ribs to increase stiffness. 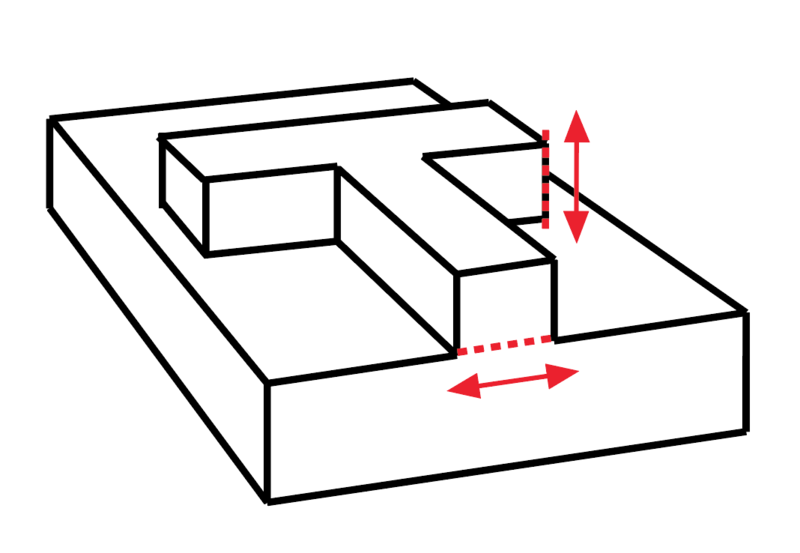 Part orientation during the printing stage can also help reduce the likelihood of warping. SLS offers a number of different material with the majority being polyamide based. Polyamides are synthetic thermoplastic polymers, more commonly known as nylons. The table below summarises the most common materials that are printed via SLS. PEBA (TPA) Rubber-like, strong yet flexible material. Alumide (Aluminium filled polyamide) High stiffness and good post-processing abilities. Carbon filled polyamide High stiffness and strength. Glass filled polyamide High stiffness and wear resistance. PA11 High impact resistance and elongation at break, environmentally friendly. PEEK Excellent mechanical properties, high temperature resistance, potential for biocompatibility and sterilizability. The size a part is able to be printed at is limited by the size of the nylon container used in the SLS machines. Currently the average build volume is around 300 mm x 300 mm x 300 mm with the bigger machines offering a build volume of 700 mm x 380 mm x 580 mm. Since every SLS printed part consists of hundreds (or even thousands!) 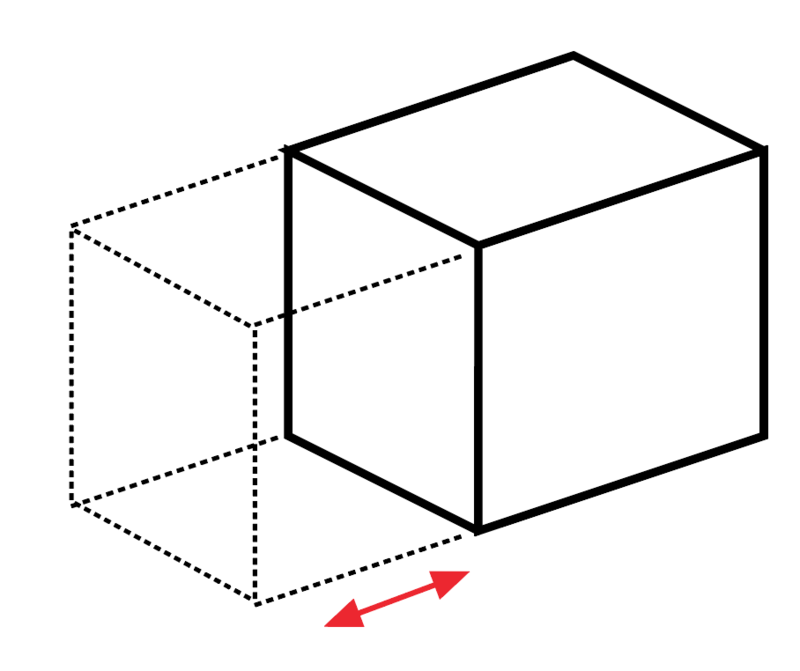 of layers, small variations between products can occur (dimensions, surface quality). In addition, due to the uniqueness of the products most post-processing steps are done manually. This also means that minor variations can occur (e.g. small color or coating variations). While SLS produces a consistent surface finish the surface appearance is a satin-like matte finish that is slightly grainy to the touch. If a shiny and smooth finish is desired post-processing is recommended. SLS parts do not required support allowing for greater design freedom making SLS one of the easier 3D printing technologies to design for. SLS can be used to produce many functional features including axles, threads, tanks and hinges. This coupled with the range of engineering polymides available result in SLS often being used to produce end use parts. The standard surface finish for SLS is a matte-like grainy surface. A range of post-processing options are available that can also help to improve part functionality. Hole size Greater than 1.5 mm diameter. Tolerances ± 0.3 mm or ± 0.05 mm/mm, whichever is greater.